Home / Gardening Care / Gardening Soil / Seed Starting Peat Pellets Vs. Soil: Which Should You Use And Why? If you’re new to growing seeds, you may be wondering if peat pellets or seed trays are the best to use for seed starting. 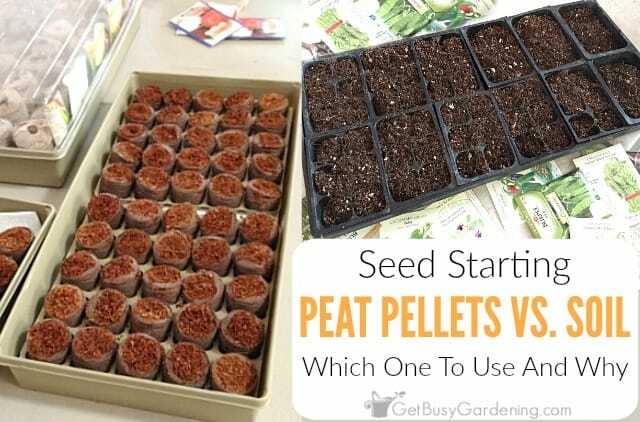 People are always asking me which seed starting medium I like best, so I thought it would be fun to do a side-by-side comparison of using seed starting peat pellets -vs- soil filled seed trays. Over the past few years, seed starting peat pellets have become very popular. They are fast and easy to use for planting seeds, and they’re fun to use too. 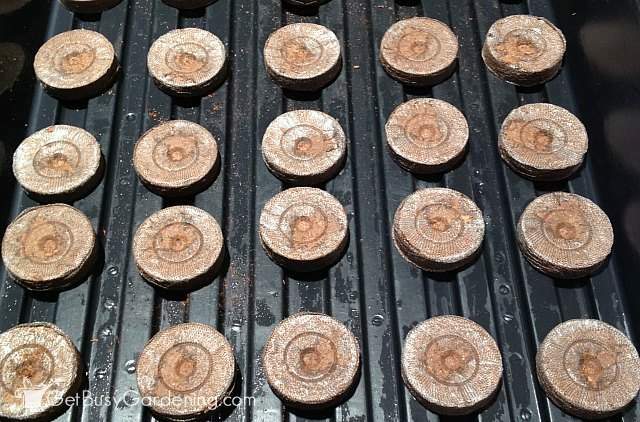 Some people really love using the seed pellets, and there are definitely advantages to using them. But there are also some disadvantages that are important to consider. If you’re new to starting seeds, then maybe you’ve never heard of peat pellets. Peat pellets (aka Jiffy seed starters or grow pellets) were designed to make starting seeds easier and more convenient for gardeners. They look like small soil discs, and are made from compressed peat moss. As the name suggests, these compressed soil discs are made out of peat moss, which is a popular medium to use to grow seeds and plants. 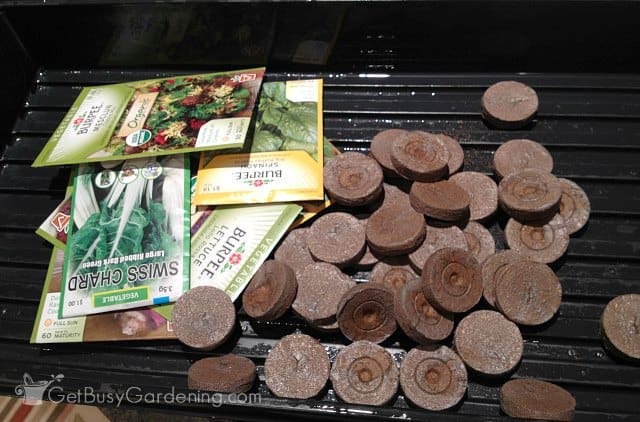 Not only do they make it easy to plant your seeds, but seed starter pellets also make planting seedlings into the garden super easy too. If you’re wondering where to buy peat pellets, you’re in luck! You should be able to find peat pellets for sale anywhere seeds and seed starting supplies are sold. Since I just explained what peat moss pellets are, I figured I’d better explain what I mean when I talk about soil filled seed planting trays. 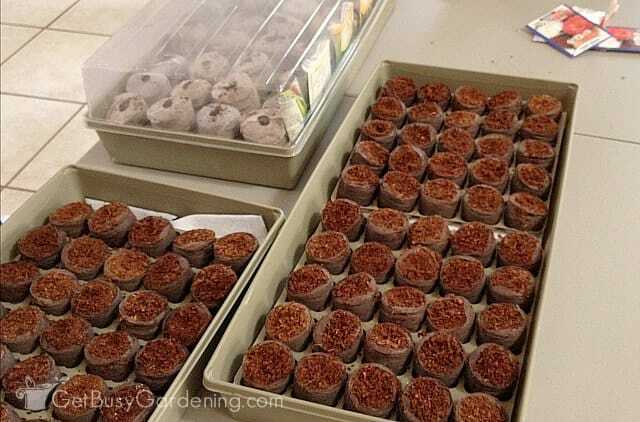 Using plastic seed starting cells and trays is the more traditional method for starting plants from seed. 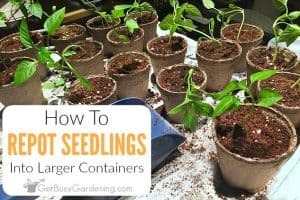 You fill the plastic cells with seed starting soil, and then plant seeds in them. This is probably what most people visualize when they think about starting seeds indoors. When it comes to choosing between these two methods, there really is no “right” way to start your seeds indoors. A lot of times it will just come down to personal preference. I used seedling trays for the first several years, and it was always very economical for me. So when I decided to try using peat pellets, the first thing that jumped out at me right away was the cost. 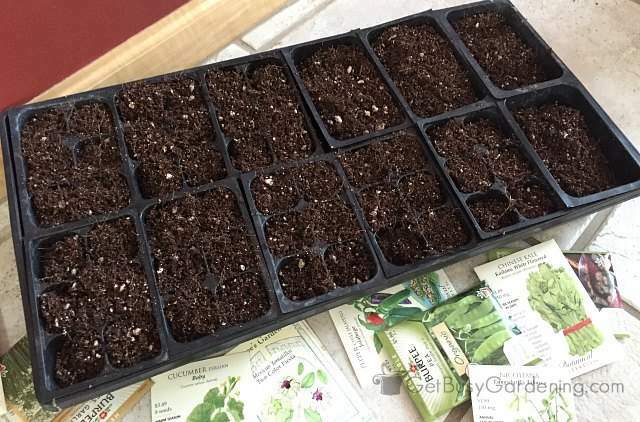 These are not as economical when compared to a large bag of organic seed starting mix and reusable plastic seedling trays (although if you’re just starting out, it will be more expensive to buy the seed starting kits – but then you can reuse them year after year). But you really have to weigh all the pros and cons, not just the cost… and one of the biggest pros for peat pellets is convenience. Ok, I’m getting a bit ahead of myself here, so let’s just jump right into the side-by-side comparison of the pros and cons for each of these two seed starting methods. The seed starting peat pellets are held together by a mesh or thin netting on the outside, which doesn’t seem to break down in the garden. The first time I used these, I was finding the mesh throughout the garden for several years after. The hole in the top is too small for large seeds (but can be opened up easy enough) – You can buy peat moss pellets for bigger seeds though, which is a great option. 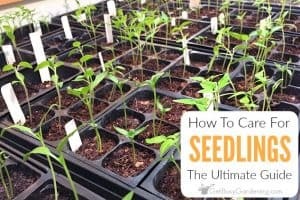 Which Seed Starting Medium Do I Prefer? There are two main things that keep me from switching to using the peat pellets vs. soil for all of my seed starting. One is cost, and the other is the fact that you have to remove the netting (or mesh) that’s on the outside, cause that won’t decompose. Neither of these are huge deal breakers for me though (the mesh outside is actually pretty easy to peel off before you plant the seedlings into the garden), and I will continue to use a mix of both methods (seed starting peat pellets are a must for seedlings that hate to be transplanted). But, if you ask me to choose peat pellets vs. soil… I personally prefer to use the seedling trays with soil over the peat pellets. 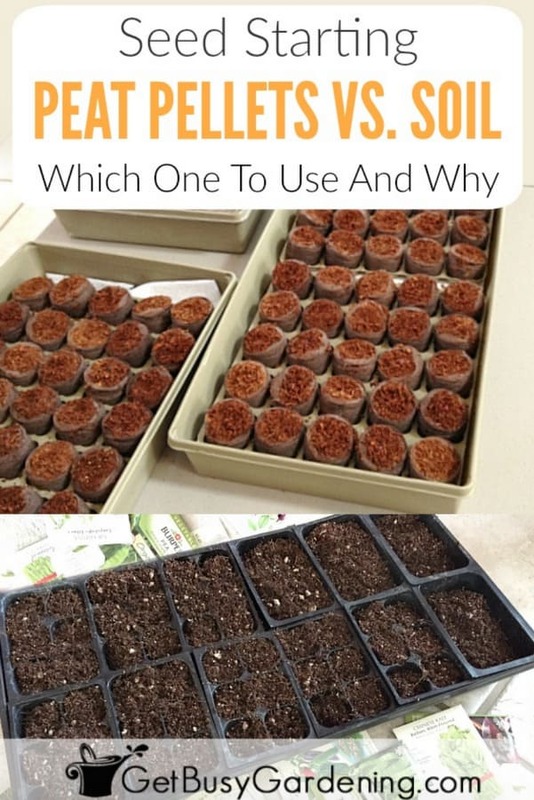 If you’re trying to decide whether peat pellets are right for you, or if you should use the traditional plastic cells and trays, I say try both and see which method you like the best! 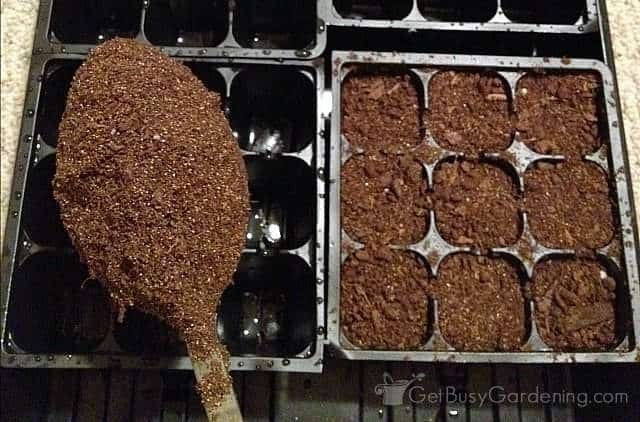 I really love how easy transplanting the Jiffy peat pellets is, and if you don’t start a ton of seeds, then the added cost won’t be a huge issue. Both methods are great, you just have to decide what’s best for you. 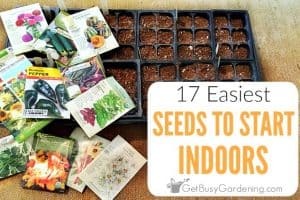 If you want to learn how to start seeds indoors, or need a quick refresher, my Starting Seeds Indoors eBook is would be perfect for you. It’s a quick-start guide that will help you get started growing your own seeds indoors. Download your copy today! Do you struggle to grow seeds, or have tried in the past but it was an epic failure? Then you should sign up for my online Seed Starting Course. This comprehensive online course will teach you everything you need to know about growing seeds, so you can skip the painful trial-and-error, and finally learn how to grow any plant you want from seed. Register today! Share your experience with using seed starting peat pellets vs. soil filled seed trays, and which method you prefer in the comments below. Last year was my first year using the pellets and I'm using them again this year. I'm frustrated to hear that the mesh doesn't decompose. YUCK! Thanks for the tip to remove it before planting. I agree, not economical at all! The replacement pellets cost as much as the pellets with the tray that I purchased last year. You're welcome. It's too bad that the pellet refills cost as much as buying a whole new seed starting kit, I'm bummed to hear that. I hate to think that people will just throw away the seed trays every year, not very eco friendly! Hopefully they’ll at least toss them into the recyling bin rather than the garbage. Well, send one of those extra seed trays my way. I could really use the humidity dome. I use dixies cups (w/starter mix or potting soil), and a cookie sheet. I've tried both methods (I did like the cells better) and actually settled on a soil blocker. It's like a tiny little press and makes blocks of soils to start seeds in. From there I usually put the larger ones (melons, squash, tomatoes) into their own little pots once they get big enough, and the smaller ones just go straight in the ground. I just watched a youtube video about the seed blocker, looks cool! It's like the seed pellets but without the mesh. Does the soil start to fall apart after a few weeks of sitting in the seed flat? 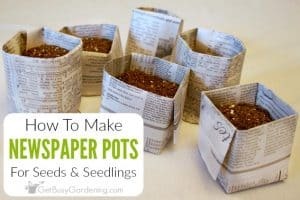 I did the cells last year, but then I learned about making your own seed starting containers using toilet paper rolls. I basically cut the rolls in half, place them in a tray and fill with seed starting mix or potting soil. It's a lot cheaper than the pellets and it's reusing something we all have! I also do this when I'm wintersowing so the transplanting will be easier. I haven't tried the toilet paper rolls yet. You'll have to let me know how you like them. Great job on the reuse! The cardboard will make it easier to plant them, and it'll break down fast too. I bought 3 sets of cell (multi pack) from Lowe's and it was very cheap last year- 5 or 6 bucks if I remember right! Also, I've seen individual cells this year, at Walmart, if you're interested. I think Linder's/Gertens nursery should carry them too, just individual pieces, seed tray cells or domes etc., and they're cheap too. I absolutely hate pellets, they dry out too fast! Thanks for the info. I scored a bunch of used seed starting trays and cells at a garage sale a few years back for free, so I have enough to last me a while. I thought it was interesting that HD only carries the peat pellet seed starter kits now. I agree about the peat pellets. I've been checking them daily to maintain the moisture. I think it'll get really annoying once I start to harden off my seedlings, then they'll need to be watered several times a day! Good info, Amy. If I ever get around to starting plants from seed indoors I think go with the cells. You could almost just plant the seeds directly in the soil this year–it's getting so warm so fast! Happy Spring! Yes, it's so nice outside I'm feeling like I'm way behind on seed starting. I have to keep reminding myself it's only March and we could still get snow. It feels like June this week. I love it! Mmmm. I guess I was always the vegetable gardening is cheaper and the product is fresher type. As to dirt is was all home composted. The flower gardens were mostly perenials. Now, I do farmers markets, since the kids are grown up, and I'm converting lawn to to wildflower gardens. And the woods to the same… Nice blog here. Wow, you have enough produce to sell it at Farmer's Markets? Good for you! That must be a lot of work. Thanks for your nice comment about my blog. I used the Peat pellets for the first time this year and I really don’t think they work well for larger seeds like beans or peas. My seedlings started busting out of them quickly, with roots invading other pellets. I had to transplant them to a bigger container after like 2 weeks. Thanks for the post. Seems, as you said, it will come down to preference. I’m new to seeding as an adult (gardened with my mom in the traditional soil packs as a kid). Do you germinate prior to using the pellets? Or do they take care of the germination process? Totally. It’s good to experiment to see which method you prefer. I never pre-germinate any of my seeds. As far as germination goes, the pellets work the same as the soil packs do. Wonderful, glad to hear it! Thanks for sharing your experience with using peat pellets for starting your seeds. Just like you, I prefer seedling trays with soil over the peat pellets. I was never successful with the latter. I’ve had good luck with the pellets. One thing to consider is to select seeds for each tray and dome that germinate in about the same number of days. I put tomato and bell pepper seeds in the same tray, and then had to uncover once the tomatoes had sprouted but the peppers hadn’t. I think the pellets hold the right moisture content for sprouting seeds better than any seed starter mix or potting soil that I’ve ever used. I mostly water from the bottom (pouring water between the cells and letting it fill the bottom of the tray). I water each day once the trays are outdoors. Sometimes I transplant the pellet to a slightly larger peat pot or plastic pot (from a previous plant purchase) before planting in garden. This is usually due to the plant getting too big for the pellet at a time when I cannot yet plant in the big garden. Nice! Thanks for your added tips and your input on using peat pellets vs seed starting soil. Hope all of your seedlings will thrive in your garden! Btw, you are supposed to pull back the netting from the top of the pellet. I wondered why this was important until one of my seeds shifted (possibly while watering) and sprouted under the mesh. Luckily I was able to tear off the mesh without damaging the seedling. Also, I don’t think it’s necessary to plant two seeds per pellet, as insurance against poor germination percentage. I had nearly a 100% germination of the tomato seeds, and the pods are cheap enough for me to “bet” one seed per pod. If you don’t get germination in one of the pods, you can still reuse it for a later crop. Like the peat pellets very much, and are able to get them for 10 cents each locally (and luckily) – very much. I did make a fun discovery this year – using toilet paper tubes AND peat pellets – together (but not at the same time)… for those leggy tomato starts. Using clear salad containers (those plastic ones with the clamshell or removable lids) or such like to put the peat pots in creates the “greenhouse” effect inside, and will sprout tomatoes no problem – much less expensive that starting trays, too. So the toms quickly grow too much for the salad box to have the lid on – THEN push the peat pellet plants to the bottom inside a TP tube – they fit just perfectly! Add some soil around your start to fill it to the brim – even if you have just a bit of tomato plant sticking it, it works perfectly, it’ll root all the way up the tube. Add soil around your plant in the TP tube, and water. You can stick them all back in the clear box until you are ready to transplant out, and they all fit – if they fit in there before! TP rolls often mold a bit on the outside but this doesn’t seem to bother the plants any. I did a second transplant from my first peat & TP tube experiment into clear plastic cups (leftover from a latte’ stand) and they rooted like mad. I just started Saguaro cactus seeds with halved peat pellets and one of those clear egg-cartons. Inflate the peat pellets with boiling water, wait ’til they cool down, squeeze them as dry as you can with your fingers (fun for the whole family!) and cut them in half – and into the egg carton. Add your seeds – I got a germination rate of about 90%. Don’t push the pellets to the bottom of the egg carton, they’ll sit out of any extra moisture. It took only 2 days for the first Saguaro to germinate. You can leave them in there just fine for months! I haven’t bought pellets yet. Can the mesh be removed before placing the seed? I plan on sticking the pellet into a cell starter. Sure, you could remove the mesh from the seed pellets any time you want after they have expanded. It’s just there to hold them together. However, if you’re planning to put them into the plastic cell trays, then there’s no need to buy the pellets. You can just use seed starting soil instead, which is usually cheaper than buying the pellets.